Cindy McGonagle: original art, miniature art, books, recipes, and guides. 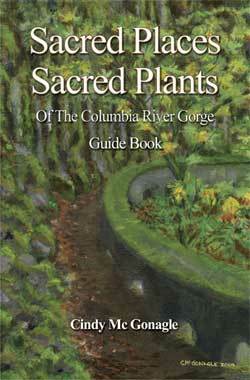 Come on a spiritual journey with the Spirits and Nature Spirits of the Columbia River Gorge. Explore the Sacred Places of power where nature challenges you to have a mystical relationship with the Earth. A self guided tour of some of the most magical and spiritual places and plants found in the Columbia River Gorge National Scenic Areas of Oregon and Washington States. Features include: Special messages shared by the Spirits and Nature Spirits connecting you with Sacred Places and Plants of the Columbia River Gorge. Illustrations of Pictographs and Sacred Plants.